History: Katie is an older brood matron. 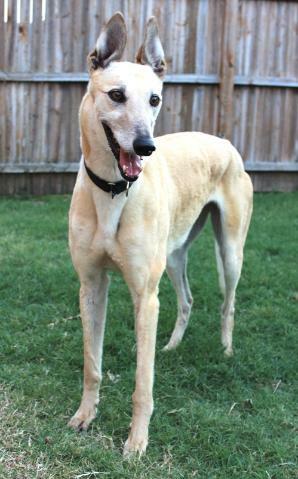 She not only retired from racing, she also retired from breeding after having two litters of pups. She’s a friendly, easy going gal. She had enough of working for a living and is now ready for a life of leisure on a soft bed. 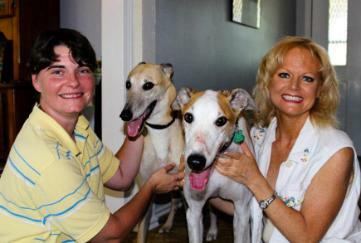 Baxter and Katie were adopted together to Kim and Tambra. 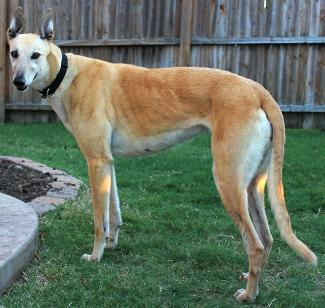 May 2, 2012 update: Katie is one of the easiest greyhounds that we’ve ever had. She came into our house from the greyhound farm and fit right in. Katie already knew her name and came when she was called. She was immediately introduced to our cat, Nermal. Katie got a few good sniffs in with her muzzle, so the cat hissed and “slapped” her across the face. That was it for Katie; she didn’t want much to do with the cats after that! 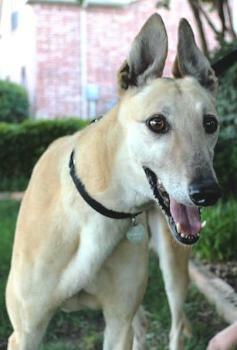 Katie also lives with an Italian Greyhound and gets along just fine with him. Katie stays in her crate while we are at work for about 8-9 hours. She doesn’t really want to go in her crate, but is fine once she’s in there. For shorter trips to the store or to run errands, she gets free run of the house. Katie is always so excited to see us when we get home. She will greet us with a very happy tail! At night, she sleeps on a dog bed in our master bedroom. She’s pretty lazy in the morning and would prefer her breakfast to be about 10:00, but she goes ahead and eats with the other greyhound in our house. 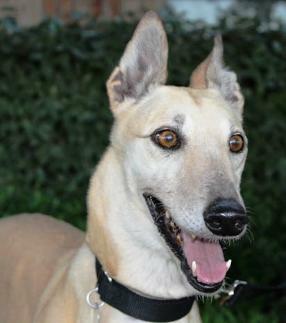 Katie’s personality is very laid back and relaxed – she’s not demanding and wants to please her humans. She really prefers to be with our family and lay on the nearest dog bed. She never barks and does not counter surf. She has GREYT manners! 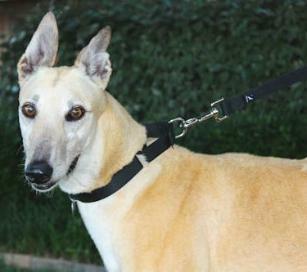 April 24, 2012 update: Came to TAGS to find her loving lifetime home.